Eni has recently published the 14th edition of the 2015 World Oil and Gas Review, the annual statistical review on the world oil and gas market and the refining system. This is a good opportunity not only to see what happened last year, but also to find out what happened in the last decade and identify the trends that characterised it. Let’s try to do it with the help of the statistics of the International Energy Agency (IEA – International Energy Agency), the organisation that has become one of the international points of reference for the collection and processing of energy data and of the data of the new eni World & Oil Gas Review. In 2013, world consumption of oil reached a new record high, amounting to 92.7 million barrels of oil a day (mb/d). Also in the period 2004-2013, global demand grew, recording a change of 8 mb/d (equivalent to an increase of 8.6%). The trend, however, was not always positive in these ten years, since there were also situations in which oil consumption decreased. 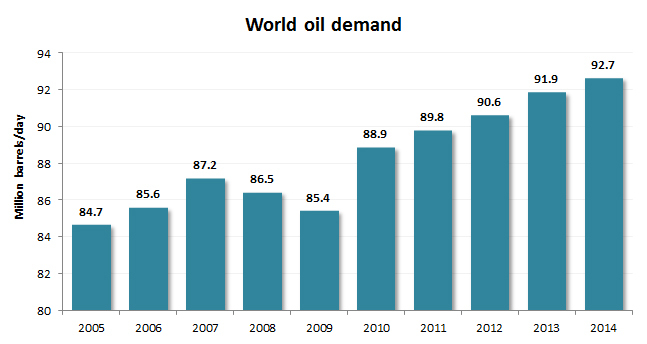 In particular, the chart of world oil demand shows a significant decrease in 2008 and 2009, in correspondence with the most acute phase of the global economic crisis. Only since 2010 has consumption started growing again. To better understand what happened, let’s start by analysing the most recent data in detail. If we compare the year-on-year percentage changes in oil demand in the various geographical areas for 2013 and 2014, we see that they reflect different economic scenarios, the result of contrasting dynamics. In fact, industrialised countries (OECD* area),whose oil consumption continue to decline, move in one direction, while emerging and developing countries (including first and foremost China, India and Brazil), which continue to increase their oil consumption with no signs of a slowdown, move in the opposite direction. The economic and financial crisis originated in the US in July 2007 and subsequently affected the whole world. However, it became particularly deep in OECD countries, starting from October 2008. In particular, the crisis caused significant damage to the economies of the most financially exposed countries. Due to the crisis, there was a general decline in the consumption of raw materials. In particular, the global demand for oil decreased by 0.9% from 2008 to 2009. The decrease did not assume even higher proportions only thanks to the emerging economies in Asia, most notably China and India, who kept their relentless upward trend in energy demand, necessary to support constant economic and industrial development. In this way, worldwide, the significant decreases in consumption recorded in industrialised countries, including North America (-3.8% compared to 2008) and Europe (-5% compared to 2008) were partially offset. Starting in 2010 there was a global recovery in oil consumption (+ 3.9% compared to 2009), due to both the relentless economic growth of emerging countries, as well as the anti-crisis policies adopted, which favoured the recovery of the areas most affected by the economic recession (North America, former Soviet Union countries, developed countries in the Pacific area). In these latter areas, the growth in oil consumption has been positive, even if the losses recorded in 2009 have not been fully recovered. In Europe, on the other hand, in 2010 the demand for oil remained virtually unchanged compared to 2009, before decreasing again, confirming the negative trend in place for several years now. As for the total consumption of individual countries, in 2014 the United States confirmed itself as the number one consumer of oil with 19.3 mb/d (20.8% of the world total). Its consumption is almost twice that of the second country, China (10.6 mb/d) and 4.3 times higher than that of another large country, Japan (4.3 mb/d). As for our country (Italy), oil consumption in 2014 amounted to 1.2 mb/d. The consumption of crude oil in industrialised (OECD) countries is steadily decreasing: in 2005 it represented 59.5% of the global demand for oil, while in 2014 only 49.2%. *The OECD (Organisation for Economic Cooperation and Development) was established with the Convention on the Organisation for Economic Cooperation and Development, signed on 14 December 1960 and which came into force on 30 September 1961, replacing the OEEC, created in 1948 to administer the so-called “Marshall Plan” for the postwar reconstruction of the European economy. From the initial 20 countries, including Italy, a founding country, the OECD today includes 34 member countries (Australia, Austria, Belgium, Canada, Chile, Denmark, Estonia, Finland, France, Germany, Japan, Great Britain, Greece, Ireland, Iceland, Israel, Italy, Luxembourg, Mexico, Norway, New Zealand, Netherlands, Poland, Portugal, Czech Republic, Republic of Korea, Slovakia, Slovenia, Spain, United States, Sweden, Switzerland, Turkey and Hungary), Chile, Estonia, Israel and Slovenia having joined more recently (between May and December 2010). What happened therefore in the last decade? From 2005 to 2014, oil demand in industrialised countries showed a trend that, after a period of steady growth, subsequently saw a slowdown in demand, recording a decrease of 10.4% in the period in question. The downward trend in demand was due to multiple causes, including: increased energy efficiency (in particular in the transport sector, where a large part of oil consumption is concentrated), change in the mix of energy sources and development of renewables, savings induced by the sharp increase in oil prices that took place during the period (in 2000 it cost $28 a barrel while the end of 2008 it reached $146.5 a barrel, in 2014 the price dropped from 112 to 62 dollars a barrel) and, finally, as we have seen, impact of the economic and financial crisis. As regards emerging and developing countries (non-OECD area), oil demand in the period 2005-2014 showed a constantly growing trend. China was the number one country, with a 26% increase in oil consumption at the end of the period compared to 2005. In practice, almost a third of the global increase in consumption in the decade (+7.98 million barrels per day) was due to the energy hunger of China (+3.04 million barrels per day). It should be noted that the change in oil demand in China (+26%) is practically the same that the rest of Asia has had (Asia – excluding China 26,5%). Ultimately, we can say that during the decade, the consumption of industrialised countries decreased, in particular due to the fall in demand in Europe and Japan (the largest consumer of the OECD Pacific area). So have we already witnessed the peak of oil demand in this area of the world and will we see a slow but inexorable decline in the next few years? Perhaps it is too soon to say, but the history of the last few years highlights the trend in place and, in addition, there are many public initiatives to foster savings in oil consumption and its more efficient use. Much of the consumption of crude oil, in fact, is attributable to the transport sector, and it is here that efforts are being focussed to consume less oil, proposing, for example, alternative fuel sources (natural gas, electricity, biofuels). Or by increasing the efficiency of existing conventional petrol and diesel engines: in fact, there are still many technical possibilities for increasing the number of kilometres travelled per litre, for example by using hybrid engine cars which alongside the petrol engine have an electric motor. A geographic area, on the other hand, in which oil consumption will certainly increase – driven by a constantly positive economic growth rate – is that of the emerging economies, particularly those in Asia (China and India). Also countries in the Middle East and Latin America will probably continue to increase their demand for oil, as was the case in the period 2005-2014. What will be the overall effect of the two dynamics on future world oil consumption? It is hard to say and opinions in this regard vary. Many, almost all, experts believe that it will continue to grow, but some think it will grow at lower rates, very low, others believe that growth will be high, driven by the development of emerging countries. Certainly, the growing attention to the issues of climate change and emissions of air pollutants will ensure – as far as possible – efforts to try to limit the increase in energy consumption. On the other hand, one cannot prevent less rich or poor countries from developing, depriving them of the fuel required to power the economy and industry and increase their standard of living, to a level equal to that of developed countries. One – partial – solution could be precisely that of continuing to rebalance global oil consumption, reducing even more that of the richest and “wasteful” countries to the benefit of the poorest. Useful information in understanding the extent of the gap between rich and poor countries and getting an idea of how much more oil would be required if the latter were to reach our level, is provided by the consumption of oil per capita. We can analyse the current situation with the aid of the statistics contained in the World Oil & Gas Review, recently published by eni. In 2014, every inhabitant of the planet consumed an average of 4.67 barrels of oil. Like any statistical average, also that of “average consumption” hides significant disparities in the distribution between countries. In fact, while in industrialised (OECD) countries, every person consumes an average of 13.13 barrels per year, in non-OECD countries average consumption is 2.87, i.e. about 4.6 times less than the former. Then, in terms of individual countries or geographies, the disparity is even more pronounced.In fact, in 2014, the total consumption of oil in America (30.8 mb/d) is of the same order of magnitude as that of Asia Pacific, which includes China and India (30.4 mb/d). This data, however, tell us little about the imbalance in consumption unless one considers the number of people living in these countries and unless one looks at the data on per capita consumption. This indicator reveals the existence of large disparities between geographies. North America is the area where per capita oil consumption has increased (in 2014, the average American consumed 22.4 barrels per year).Basically, on average, every US citizen consumes almost three times that of a European citizen (7.95 barrels per year), more than 8 times the consumption of a Chinese citizen (2.78 barrels per year), more than twenty times the consumption an Indian citizen (1.1 barrel per year) and more than 112 times that of an inhabitant of Ethiopia (0.2 barrels per year). From these few figures it is clear that in North America every person consumes a lot of oil, perhaps too much, and it would be appropriate to use the most efficient technologies and save energy. The United States is aware of this and, in these last few years, it has decided to give itself targets to reduce the consumption per kilometre of its cars, the most thirsty in the world. But let’s go back to the analysis of per capita oil consumption. In the last 10 years, average world per capita consumption has decreased, albeit slightly, from 4.74 barrels in 2005 to 4.67 barrels in 2014. In OECD countries, this indicator was stable until 2007, then it began to decline, partly due to the economic crisis. In China, per capita consumption has increased in ten years, albeit remaining at very low levels. Considering that we are talking about a country with a population of approx. 1.4 billion people, we can say that this was significant growth with a significant impact worldwide (and we saw this earlier when we analysed the trend of total consumption in the period 2005-2014). In the Africa and Asia Pacific countries, on the other hand, per capita consumption grew very little and, therefore, is extremely low, equal to 1.41 and 2.81 barrels per capita per year, respectively. This is a clear sign of the poverty and extremely poor living conditions that continue to plague these populations. What we have seen so far are just some of the many pieces of data available for each country. Anyone wishing to explore these issues can find useful and detailed statistics in the eni World Oil & Gas Review. We still have one last curiosity to be satisfied: what was the demand for oil in Italy in recent years? Looking at consumption in the period 2005-2014, it can be seen that the trend has been steadily declining. The decrease in oil demand in Italy is mainly due to the country’s energy choices. In fact, natural gas – also due to its environmental benefits – has gradually taken the place of oil as the fossil fuel in energy production in the electricity generation sector, in industry and also in the heating of buildings. In 2008 and 2009, moreover, also Italy, like other industrialised countries, was affected by the economic and financial crisis. In 2010, however, the downward trend continued and no “recovery” in consumption was observed, as in other countries. So, also in our country, we can say that perhaps we have reached the peak in oil consumption (in the early 2000s) and that for the coming years it is highly probable that there will be a further decrease or substantially stability in the demand for oil. To study the energy requirements of the planet, it is necessary to have scientific analyses and updated, complete and reliable historical data, making it possible to identify the trends of the energy future. It is precisely with this spirit that eni publishes the World Oil and Gas Review (WOGR), now in its 14th edition. The WOGR is one of the most important sources of information on the oil and natural gas market. Also in this edition, the oil and natural gas industry and markets are illustrated with data on production, reserves, consumption, imports and exports. Each of these indicators is provided by country, by geographical area and by market area. These figures are accompanied by specific indicators, charts and rankings that provide an additional interpretation compared to the absolute values alone.